Plantar fasciitis: is the term used to describe the inflammation of the plantar fascia. Do you get heel pain in your foot that is worse during those first few steps out of bed in the morning? Or does your heel hurt after jogging, playing sport or even a long day on your feet? If so you may be suffering from plantar fasciitis. Please note, if you have had these symptoms for a month or longer and its progressively getting worse, it is more likely that you are suffering from Plantar fasciopathy the long term version of plantar fasciitis. Plantar fasciitis is caused by an inflammation of the plantar fascia (the tissue along the bottom of your foot that connects your heel bone to your toes). Plantar fasciitis causes stabbing or burning pain that's usually worse in the morning. Once your foot limbers up, the pain normally decreases, but it may return after long periods of standing or after getting up from a seated position. In most cases, you can overcome the pain of plantar fasciitis without invasive treatments as well as take the steps to prevent plantar fasciitis from recurring, or plantar fasciopathy from developing. Under normal circumstances, your plantar fascia acts like a shock-absorbing bowstring, supporting the arch in your foot. But, if tension on that bowstring becomes too great, it can create small tears in the fascia and can cause the ligament to separate from the heel bone, fibre by fibre. Gradual tearing leads to inflammation, which leads to plantar fasciitis. In long term cases when inflammation has subsided and there is a delay or disruption in the healing process, degeneration can occur and is more appropriately termed "plantar fasciosis". 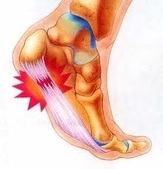 See here for more discussion of plantar fasciitis vs fasciosis. A bone spur (heel spur) may form if this injury continues, where calcium is deposited near the heel in an attempt to "glue" the detached fibres back onto the heel. The bone spur itself has no nerve endings and doesn't hurt, however, this is a sign that overuse of this area has been present for sometime. Plantar fasciitis usually develops suddenly, often after an injury or a long day on the feet and can be severe. Although it can affect both feet, it more often presents in only one foot at a time. - Sharp pain in the inside part of the bottom of your heel, which may feel like a knife sticking into the bottom of your foot. - Heel pain that tends to be worse with the first few steps after awakening, when climbing stairs or when standing on tiptoe. - Heel pain after long periods of standing or after getting up from a seated position. - Heel pain during and after exercise. 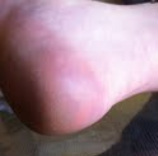 - Mild swelling in your heel. Increased physical activity and overload. Plantar fasciitis is common in long-distance runners. Jogging, walking or stair climbing also can place too much stress on your heel bone and the soft tissue attached to it, especially as part of an aggressive new training regime. Even household exertion, such as standing on ladders, moving furniture or large appliances, can trigger the pain. Bad Shoes or poor foot wear choices. Shoes that are thin-soled, loose, lack arch support or the ability to absorb shock don't protect your feet, and can cause added stress to your heels. If you regularly wear shoes with high heels, your Achilles tendon (which is also attached to your heel) can contract and shorten, causing strain on the tissue around your heel and walking abnormalities. Recent weight gain. the extra weight on your feet and hormone changes that occur with excess weight can be a contributing factor. The increase in load on your feet and plantar fascia can in some cases cause damage. Flat Feet (over-pronation), high arched (rigid feet), abnormal walking patterns or instability can adversely affect the heels. Changes in gait (the way you walk) can lead to added stresses on the plantar fascia causing tearing and pain. Trauma which involves excessive pull on the plantar fascia. This can include slipping off a step or tripping. Arthritis. Some types of arthritis can cause inflammation in the tendons in the bottom of your foot, which may lead to plantar fasciitis. Diabetes. There may be a link between plantar fasciitis and diabetes. However more specific research is still required. Tight Achilles tendon This may cause excess strain on the plantar fascia. Long hours on your feet. Pressure and strain on your feet from long hours of walking or standing such as in factory or retail workers can lead to stress and tension in the foot muscles and plantar fascia. An increase in activity or change in activity such as painting, gardening or climbing hills or ladders can also be a potential cause. Your doctor or Podiatrist will ask you about your symptoms and look for points of tenderness in your foot. This can help rule out other causes of heel pain, such as medial calcaneal nerve impingement and fat pad impingement Your Podiatrist may also suggest an ultrasound to assess the fascia and to confirm the diagnosis. In more complex cases your podiatrist may also order an X-ray to rule out other pathologies that may be present. Icing for 10-20 mins, two - three times a day. The easiest way to do this is with a gel freezer pack, or if you prefer you can freeze a 600ml plastic bottle of water and roll the arch of your foot over it gently. Icing should be performed after completing exercise, stretching, and strengthening, and this treatment can be applied via ice massage, ice bath, or ice pack. Further instructions will be sent via email after your initial appointment. Panadol/Aspirin/NSAIDS. These will help take down the inflammation in true plantar fasciitis as well as the pain, however often does little in long term cases where the pain is most likely from degeneration. Shoes. Wearing sensible shoes such a sneakers. If needed, try a new pair of shoes. Pick shoes with good arch support and a cushioned sole such a sneaker. If you're not sure if your shoes are suitable or you think they might be the cause of your heel pain, bring them in for an assessment. Preventing Harmful Activity. If a particular activity hurts, try to avoid it until the heel is properly healed. Reducing the activity that may have caused the problem in the first place is a major step to overcoming plantar fasciitis. Remember that walking up or down stairs, standing on ladders, kneeling or squatting can aggravate the plantar fascia. Voltaren Gel. Questionable effect and may be placebo however some people find it effective. Low Dye taping for the feet. This can be performed by your podiatrist and taught for self application. Rest from activities that cause pain is crucial during the first few days. Orthotics. These are insoles used to provide relief to plantar fasciitis suffers. Orthotics help to keep pressure off the heel and reduce the force on the weakened fascia. They also help by correcting any abnormal walking patterns or biomechanics that may lead to plantar fasciitis and heel pain. These can either be premade or customised. Gentle Stretches. Before you get up from bed or before any activities give your arch (plantar fascia & quadratus plantae) and Achilles Tendon a very gentle stretch. Stretching the arch helps reverse the tightening of the plantar fascia that occurs overnight and encourages agility. Stronger stretches may be used in stage 2 of treatment (plantar fasciopathy) for those with limited range of motion and an ongoing history of plantar fasciopathy. Mobilisation / Dry needling / Massage. This can be performed at any of our Adelaide clinics by your podiatrist. Cortisone Injection. Used only with caution and in more complicated cases, cortisone is potent anti-inflammatory agent which can be injected at the site of maximal tenderness or inflammation. This injection is very precise and can be performed at most radiology clinics under ultrasound guidance with a referral from your podiatrist. Once the area has settled down and is starting to recover treatment then shifts towards strengthening and rehabilitation of the plantar fascia and associated structures. Once you have reached this stage there are an number of additional treatments that your podiatrist can recommend that can be used to speed up the recovery process and rebuild the plantar fascia. Maintain a healthy weight. This minimizes the stress on your plantar fascia. Choose supportive shoes. Forget the stilettos for the time being and avoid shoes with excessively low heels such as soccer boots and thongs. Shoes with a low to moderate heel are best. Other features that are important include a good arch support, firm support around the heels and shock absorbency. Try to avoid going barefoot as much as possible, especially on hard surfaces and avoid shoes that are too too soft which can cause added stress to feet as well. Don't wear worn-out athletic shoes. Replace your old athletic shoes before they stop supporting and cushioning your feet. If you're a runner, buy new running shoes after every 3 months or so of use, if not every 6 months or so for those with problem feet. Start sports activities slowly. Warm up before starting any athletic activity, gym program or sport, and start a new exercise program slowly as plantar fasciitis is often seen in the "Weekend Warrior" or when the 40 something year old man, decides to become a runner for the first time in his life and goes too hard on his feet. Gentle Stretches. Before you get up from bed or before any activities give your arch and Achilles Tendon a good (but gentle) stretch. Stretching the arch helps reverse the tightening of the plantar fascia that occurs overnight and encourages agility.